I almost appeared to be a "party spoiler" last week: amid all the enthusiasm among iPhone/iPad app developers over Apple's letter to Lodsys, I wrote that "Apple's letter in and of itself is not yet a reason to celebrate. This could still get quite unpleasant for some app devs." As you can see, two of the defendants are based outside of the United States. In this section of my Lodsys FAQ I had pointed out that possibility. And very importantly, this lawsuit is not limited to iOS but also targets Android in at least one case (emphasized in the list above: Labyrinth for Android). I discussed Lodsys's assertions against Android apps in this recent blog post. I also emphasized the Mac version of Twitterriffic, which is explicitly accused in the complaint. Lodsys asks for injunctions and damages. As I warned in this section of my Lodsys FAQ, Lodsys indeed claims that its letters to app developers may already have created a basis for willful infringement, which could result in treble damages. At the latest, Lodsys claims that the filing of its complaint marks the point in time from which all further "infringement" is willful. "Why did Lodsys sue some App Developers on May 31, 2011"
"Lodsys chose to move its litigation timing to an earlier date than originally planned, in response to Apple's threat, in order to preserve its legal options." Let me explain this: Apple didn't really make any "threat" against Lodsys. Apple took a position concerning the scope of its license, and Lodsys today made it clear -- in addition to the lawsuit it filed -- that it disagrees with Apple (see "Apple's License Claim Disputed and Lodsys's other blog posts). The only way I understand Lodsys's claim that it needed "to preserve its legal options" is presumably that Lodsys feared Apple might seek declaratory judgment of non-infringement in a different jurisdiction than East Texas, the troll-friendly venue Lodsys chose (as I expected). Maybe it would have been a good idea for Apple to seek declaratory judgment much sooner, but Apple either didn't want to do that or was just too slow. Some have expressed doubts about Apple's standing against Lodsys (its right to sue), but that's a legalistic detail. If Apple didn't find a theory based on which it would have standing, it could always have funded a declaratory judgment action by one or more app developers. For the app developers who have been sued, this is now a very critical situation. As I explained in my Lodsys FAQ, patent litigation in the United States is extremely costly. The most important thing for those app developers is to clarify with Apple -- and to the extent that Android apps are involved, with Google -- whether they will be held harmless and receive blanket coverage including possible damage awards. There was at least one patent attorney who disputed on Twitter that it would make sense for Lodsys to sue little app developers given that there isn't much money to be made with them. But I explained before that the economics of this would be different. I said Lodsys would sue to set an example and demonstrate its determination. The mobile app ecosystem at large is certainly enough of an opportunity for Lodsys, and let's not forget that they previously sued a group of large companies. Lodsys disagrees with Apple's analysis in the strongest terms. On its blog, Lodsys says that it sent a letter to Apple with "a detailed legal position on the license interpretation issue" and that Apple has Lodsys's permission to publish that letter, but Lodsys does not want to do so without Apple's consent "because it refers to information that was obtained with an obligation of confidentiality to Apple." To emphasize its position even more strongly, Lodsys offers a wager, promising $1,000 to "each entity to whom [Lodsys has] sent an infringement notice for infringement on the iOS platform, or that [Lodsys will] send a notice to in the future, if it turns out that the scope of Apple's existing license rights apply to fully license [the app dev] with respect to [Lodsys's] claim relating to [the app dev's] App on Apple iOS." Obviously, $1,000 is not much to gain considering that even an initial analysis of a patent assertion letter by a qualified attorney will typically cost much more than $1,000. And a lawsuit can cost millions. However, the fact that Lodsys publishes such a promise shows that it really doesn't believe in Apple's representations (concerning the scope of the license) at all. Lodsys clearly states in one of its latest blog posts that it targets Apple and Android developers because it believes that "if you are a Developer, it's about knowledge about the scope and risks of your own business." That's a formalistic position. Of course, being small does not mean that one can ignore the law. But Lodsys's motivation is stated as well: "Lodsys has only one motivation: we want to get paid for our rights." In this section of my Lodsys FAQ I already explained that in my view Lodsys had a Plan A and a Plan B from the outset: preferably Lodsys would like Apple and (with respect to Android) Google to pay up to address the problem, but failing that, Lodsys was (as no one can doubt today) fully prepared to take action against little app developers. And while there's so much attention to Lodsys now, let's not forget about MacroSolve, a company that previously sued (and is still suing) several small app developers -- in at least one case even without any prior patent assertion letter of the kind Lodsys sent out. About a year ago -- on May 18, 2010 to be precise -- Microsoft sued Salesforce.com "for infringement of nine Microsoft patents by their CRM product." Apparently Salesforce.com had refused to enter into a royalty-bearing license agreement. About five weeks later -- on June 24, 2010 -- Salesforce.com countersued Microsoft over five patents. The assignment history of those patents shows that three of the patents asserted by Salesforce.com had been assigned to it on May 3, 2010 by the Open Invention Network (OIN), a patent pool company that claims to protect Linux. On the same day, the OIN had also given Salesforce.com a fourth patent, but for whatever reason Salesforce.com decided not to assert that one against Microsoft. The dispute was settled another six weeks after Salesforce.com's countersuit: on August 4, 2010 Microsoft made this announcement, according to which "Microsoft indicated that it is being compensated by Salesforce.com based on the strength of Microsoft's leading patent portfolio in the areas of operating systems, cloud services and customer relationship management software." In other words, Salesforce.com came out on the losing end regardless of OIN's patent gift. The OIN usually likes to brag about how it thwarted Microsoft's allegedly Linux-hostile plans and helped TomTom (although that's highly doubtful, given that the outcome was like in the Salesforce.com case and Microsoft ended up receiving royalties). But very interestingly, the OIN never talked about its transfer of patents to Salesforce.com. This raises important and serious issues concerning not only the questionable effectiveness and unquestionable opacity of the OIN but also this defensive-patents-on-demand kind of service, which other patent pools such as publicly-traded RPX Corp. offer as well. With so much patent litigation going on, there will be more lawsuits down the road in which patents checked out from pools will be asserted. I looked at the nine patents Microsoft asserted against Salesforce.com. While Salesforce.com runs its server farm on Linux, none of those nine patents appears to me to be specifically Linux-related. There are various Microsoft patents (such as the FAT patents) that definitely read on the Linux kernel, and the aforementioned announcement of the settlement suggests that Salesforce.com is now paying Microsoft royalties for using Linux, but the nine patents Microsoft asserted against Salesforce.com in court appear to cover typical cloud and web service functionality (though only detailed claim charts could provide absolute certainty concerning the actual infringement patterns). Therefore, the OIN's involvement with this dispute was in a gray area, which could be part of the reason why the OIN never talked about it. The OIN claims to protect Linux (according to its own arbitrary and changing "Linux System" definition). Salesforce.com's cloud software running on top of Linux was never part of that definition. Nevertheless the OIN apparently interpreted Microsoft's patent suit against Salesforce.com as a Linux issue. Since the OIN gave Salesforce.com those four patents even before Microsoft's suit, it's possible that the OIN and Salesforce merely expected Microsoft to sue over Linux-related patents. The two non-OIN patents asserted by Salesforce.com against Microsoft were U.S. Patent No. 7,209,929, an original Salesforce.com patent on a "Java object cache server for databases", and U.S. Patent No. 7,305,454 on an "apparatus and methods for provisioning services", which was filed by a company in San Francisco and changed hands a few times (mostly within the same building) before being acquired by Salesfore.com in 2007. If a company doesn't have enough patents of its own to assert, it may try its luck with patents checked out from pools. Apparently Salesforce.com had only one internal patent that it thought it could assert against Microsoft, plus one it acquired a few year before, so getting patents from OIN was necessary to put together a set of five patents, which looked reasonably solid just based on the number. In principle, a patent can be transferred and asserted on the same day. It's not against the law, but is it effective? I'm sure that every litigator will prefer to assert patents that can be portrayed to a judge and a jury as rights related to legitimate internal inventions. It's much better in psychological terms to ask the courts for help if someone else (allegedly) infringes on one's own intellectual property. If the dispute between Microsoft and Salesforce.com had gone to trial, Microsoft's lawyers could (and probably would) have pointed out to the judge and the jury what the history of those patents was. In that case, Salesforce.com could have told the story of how it needed to acquire those patents for defensive purposes. But no matter how much the concept of mutually assured destruction (or mutually assured damage) is a reality, it's just not the story you want to tell a judge and a jury when it comes to why you ask for an injunction and a damage award. In that scenario you want to be as close as possible to the lone inventor whose rights someone else blatantly disregards. Besides the psychological aspect of this, the legal position of a patent holder can't be better than if the right holder actually practices the invention (such as by selling products on which the patent reads). Of course, if one acquires a patent and practices the invention, then the fact that the patent wasn't "homegrown" makes only a psychological difference. But it's not easy to find and acquire patents covering inventions one actually practices. I previously pointed out that the OIN apparently transferred four of its patents to Salesforce.com even before Microsoft had formally sued, and I can't see a clear Linux context in Microsoft's lawsuit (only in the announcement of the settlement). Interestingly, Salesforce.com was not even an OIN member or licensee at the time of that transfer. It isn't on the list of OIN licensees even now that I write these lines (more than a year after the transfer). Unless the OIN did a clandestine agreement with Salesforce.com, this means that Salesforce.com got support from the OIN (even though that support apparently didn't have much impact) but would still be free to assert its own patents against any current or future OIN members. That seems very unbalanced and questionable. By contrast, TomTom became an OIN member during its dispute with Microsoft. It's generally disconcerting that the OIN secretly sells some of its patents to third parties. The OIN portrays its patent purchases as a way to ensure certain patents don't fall in the hands of "trolls" or strategic enemies of Linux. But if the OIN sells patents to non-members and non-licensees like Salesforce.com, it's possible (unless the OIN took precautionary measures it never talked about) that those entities might sell those patents on to other parties who could use them against OIN members, at least in non-Linux contexts. In that case, the OIN would end up contributing -- indirectly -- to the rampant troll problem. All patent pools have the problem that a patent can only be checked out by one licensee/customer at the same time. By giving those patents to Salesforce.com, the OIN made it impossible for any of its supporters to have access to those patents if they had needed them at the same time. And there's the question of openness. If an entity calls itself the Open Invention Network and claims to be a guardian of open source, it should be reasonably transparent. If it transfers patents, it should tell its licensees that it did so, and specifiy why and on which terms such a transfer took place. The Salesforce.com patent deal went almost completely unnoticed. The only mentioning of that deal that I was able to find on the Internet was on a Japenese CNET blog. The OIN is preparing a major reform, and I hope "OIN 2.0" will then be more forthcoming about its dealings -- including its defeats. While all of the major mobile platforms have to deal with widespread "trollish" activities, Android's intellectual property problems have a variety of unique characteristics. There's no doubt that Android's popularity and its potential disruptive effect have contributed to the fact that 44 Android-related intellectual property lawsuits have been filed since March 2010. But it isn't all just attributable to Android's market share. It's only one reason, not the only one. There are also some Android-specific reasons for this mess, some of which have to do with Google's approach to other companies' intellectual property. Other mobile platforms also face troll problems and, in a few cases, efforts by large players to levy a patent tax. Apple, for example, is embroiled in disputes with Eastman Kodak and Nokia that fall into the latter category. But in Android's case it's noticeable that a handful of sizable, publicly traded IT companies believe Google's software infringes on their intellectual property rights. The latest major player to make such assertions is eBay (including its wholly-owned PayPal subsidiary). There's also a PDF version available for download from Scribd. You can also share the graphic conveniently on Twitter via Twitpic. The aggregate market cap of the top five right holders exceeds $734 billion, while the corresponding amount on the right side of the chart is less than half of that ($343 billion). Roughly half of the latter amount relates to Google itself, and those assertions are about what Google does more so than about what Google's partners do. 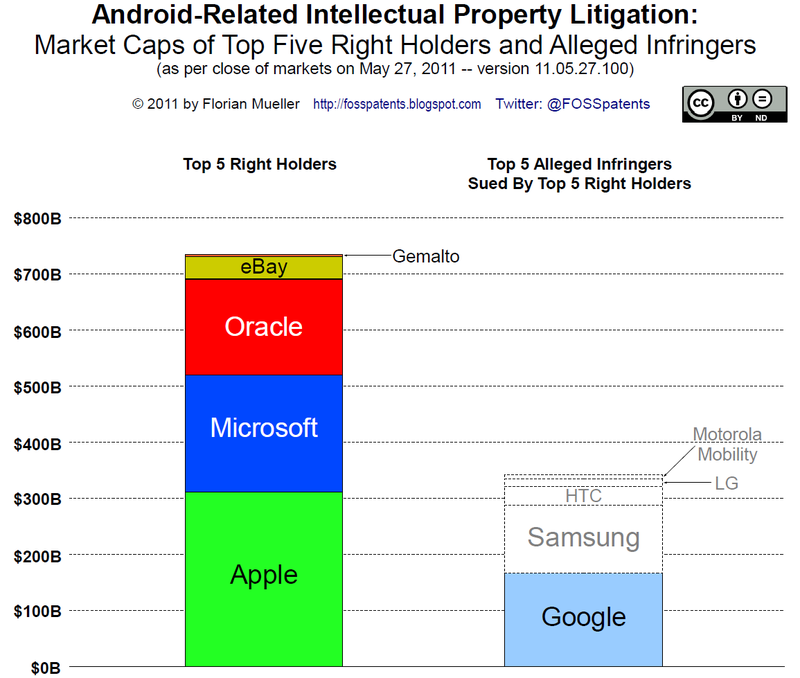 Only Oracle and eBay sue Google exclusively, and Gemalto sues Google as well as three Android device makers. But Apple's and Microsoft's assertions are also primarily attributable to Google's alleged infringements. Even in the Samsung case, which is in no small part about infringement of design-related rights, Apple asserts utility patents, all of which but one or two are related to Android in general. In other words, those device makers serve as "proxies." From a strategic point of view, Google faces a bigger problem than the device makers. Samsung, HTC and LG are not exclusively committed to Android and also build phones running Windows Phone 7 and other platforms. Motorola Mobility has been rumored to be building a team to develop its own mobile operating system. So if Google cannot solve Android's intellectual property issues, its device makers could even abandon the platform at some point. In the court of law, cases are (and should be) decided on how the judges and juries view their merits. A company with a minuscule market cap has the chance to beat an Apple. However, I thought it was nevertheless interesting to see to what extent Google's approach toward intellectual property rights has brought up major industry players against it. It wouldn't be possible to draw up a comparable chart for Apple's iOS, RIM's BlackBerry or Microsoft's Windows Phone. You can find troll attacks on any of them, but you won't find claims of intellectual property infringement by several players of the nature and stature you see on the left side in the chart shown above. Quite frequently, those who assert patents against Apple's iOS and its iOS-based devices also go after Google's Android (and Android-based devices). Most of the time it happens simultaneously, but today I found out that two patent trolls who recently attacked Apple's platform have expanded their activities and started to tackle Android. Note that Lodsys hasn't sued yet; in that case we're talking about letters demanding royalties from little app developers who are economically defenseless unless a major player helps them. But Visual Interactive Phone Concepts, the videophone patent troll on whom I already reported yesterday, has sued Google. That is Android-related patent infringement lawsuit no. 43 by my count. If one counts not only patent but all intellectual property infringement lawsuits, it's no. 44 because then eBay's and PayPal's new lawsuit against Google, which relates in no small part to trade secrets (also an intellectual property right), must be added on top. I'll now discuss the latest in the Lodsys mess and below that one I'll talk about that videophone patent troll's two new lawsuits (filed today). An Android app developer posted to the "Android Discuss" Google [discussion] group a request for "direction from Google" after he received a letter from Lodsys, claiming patent royalties for an Android app that offers in-app purchasing. I became aware of that post thanks to tweets pointing to this MacRumors article. As I told ReadWriteWeb earlier today, that information hasn't been corroborated by anyone else yet, but that app developer's story is credible to me. In my Lodsys FAQ (published about a week before Apple's letter to Lodsys) I already addressed the question of whether Lodsys might make assertions against apps running on other platforms than Apple's iOS, and I pointed out that Lodsys's FAQ used the same language in connection with the patent license that -- even according to Lodsys's own representation -- had (well ahead of Lodsys getting to acquire those patents) been granted to Apple (although the companies clearly disagree whether or not that covers Apple's app developers in connection with in-app purchasing) and the licenses some other companies, of which Lodsys mentioned Google and Microsoft in particular, received. In that FAQ I had also explained how I believe those companies (and others, including Nokia) received a license to those patents: most likely, they didn't do a deal on those patents in particular but licensed them along with about 30,000 other Intellectual Ventures portfolios while they belonged to that entity, which Apple, Google, Microsoft and others financed (for a complete list of Intellectual Ventures investors, check out this PatentlyO blog post). Since Lodsys believes that Apple's license doesn't cover its app developers, it's logical and consistent that it takes the same position on Google's (and probably also on Microsoft's) license, if my assumption is right (which I'm pretty sure of) that they all have the same kind of license. A couple of people asked me today whether I thought that Lodsys is going after Android developers because Apple's letter took care of iOS developers. The answer is absolutely positively NO. Apple's letter is not the end of the road for Lodsys. I'm convinced that Apple's reaction -- saying that their license covers app devs -- was just the most likely reaction of all possibilities Lodsys contemplated and, in fact, anticipated. Lodsys's own FAQ already addressed this even before Apple spoke out. Lodsys will continue to pursue its agenda vigorously. Whether we will hear from them depends on whether they will go ahead and sue Apple and/or (more likely) some app developers. If all that happens now is closed-door negotiation with Apple and a private settlement, it may look like Lodsys never made the next step in this, but unless Apple pays them, the most likely next step will be for them to sue someone sooner or later. The expansion of Lodsys's activities to Android apps (provided that the Google groups post is accurate, which I tend to believe it is) was probably also part of its original game plan. I hope we will soon find out whether Lodsys wrote to Android app developers only after or also before Apple's letter, but at any rate I'm sure it was part of the plan. Also, Lodsys doesn't have too much time to act before the patent it asserts against in-app purchasing will expire (at which point it could, however, still try to get paid for past "infringement"). The key question now is whether Google will take a similar stance vis-à-vis Lodsys as Apple did. I personally hope they will do at least that and hopefully do something better: tell their app developers what kind of coverage they have if they refuse to meet those royalty demands (something that Apple didn't state explicitly). If you're an Android app dev who got contacted by Lodsys, please fill out my contact form. I will treat your information confidentially and won't publish anything about what you tell me before you grant your consent by email. And let's not forget that there's a patent assertion going on against some little app developers that's even worse than Lodsys: MacroSolve is suing some of them, in at least one case without advance warning. MacroSolve's assertions targeted apps on multiple platforms (mostly iOS, Android and BlackBerry) from the start. No intervention by any of the platform makers is known in connection with MacroSolve yet. Yesterdady I reported on Visual Interactive Phone Concepts' lawsuits against Apple, AT&T and US Cellular. I then stated that "anyone building videophones based on other operating systems (such as Android) will also be asked to pay and, potentially, sued in the future." I just didn't know it was already in the making. Today that company also sued Google and the #1 wireless communications provider in the United States, Verizon. Those complaints (one for each defendant) were filed with the same court as the three previous ones: the U.S. District Court for the Eastern District of Michigan. The accusation against Google is that "Google designs, manufactures and sells an operating system for mobile communication devices that are videophones. Google also provides to users products and services associated with and to be used with the mobile communication devices that contain means for inputting information into the videophone for purposes of accessing and ordering applications and means for viewing and receiving video and data from Google and other vendors." That operating system is undoubtedly Android. The "services" mentioned in the quoted passage would probably also include YouTube, but it isn't mentioned by name. The only example the complaint states appears to be the Android Market: "Google provides an application service for users to view, download, and use applications, music and books on their videophones (the 'Market')." The accusations against Verizon are structurally consistent with those previously brought against the #2 and #7 in its market (AT&T and US Cellular), i.e., focus on services with a "central data server" (for details, see my related post). In Verizon's case, the services stated as examples include "a video on demand service [for] TV episodes and sports events", "a mobile music service", "a V Cast media manager service [for] miscellaneous media content", and "a Media Store service [for] ringtones, games and other applications". As a consumer and from an industry point of view, I want healthy competition in the field of electronic (and increasingly mobile) payments. I personally like (and have been an early adopter of) a number of Google services. For example, Amazon just sent out my second Android-based smartphone (Samsung Galaxy S2). So I would really want Google to compete fiercely with e-payment powerhouse PayPal (a wholly owned eBay subsidiary) on the basis of honest, independent innovation. Regrettably, a complaint filed by eBay/PayPal (with the Superior Court of the State of California for the county of Santa Clara) against Google contains indications -- unusually strong ones at this stage of a litigation -- that the search giant's just-announced Google Wallet mobile payment system was created on an apparently problematic basis. The complaint basically says that Google negotiated a partnership with PayPal but at a point when the two companies were allegedly very close to a formal agreement, Google poached PayPal's chief negotiator Osama Bedier and, at around that time or not much later, Stephanie Tilenius (now a senior vice president at Google) and some other key people, some or all of whom are now accused of stealing eBay/PayPal trade secrets. Trade secrets are an intellectual property right. So are (among others) copyright, trademarks, and patents. In my opinion, the stage is set for a subsequent patent infringement suit by eBay/PayPal against Google. I don't know whether it will happen next week, next month, later this year or sometime next year, but having analyzed the situation and in light of certain parallels with the Skyhook v. Google dispute, I see a very high probability of patent assertions by eBay/PayPal. It would really be a highly logical thing to happen. I can see reasons why eBay/PayPal might still wait a little bit, possibly even a year or so, and I'll explain those possible reasons in more detail further below. The two most important possible reasons are that eBay/PayPal might want to previously make some headway with the first lawsuit (especially at the discovery stage) and that some eBay patent applications particularly relevant to Google Wallet may currently be under examination but issue in the near term. In order to have the appropriate context for the patent dispute that I believe is now looming LARGE, let me firstly talk a little bit more about the trade secrets, breach-of-contract and unfair competition lawsuit that has already been filed. I mentioned Skyhook before and blogged about that dispute about three months ago. Skyhook had deals with Android device makers (particularly Motorola and Samsung) in place to ship their geopositioning software but it appears that Google (including Android chief Andy Rubin) then interfered and bullied those manufacturers so they dropped Skyhook's technology in favor of exclusively using Google Location Services. Skyhook filed an unfair competition suit as well as a simultaneous patent infringement suit last September. Unfair competition is also the legal theory behind one of eBay's and PayPal's nine causes of action, and I already said that I'll talk about the patent aspect further below. The Skyhook case was already quite interesting just based on the initial complaint and an early summary judgment motion because it is fundamentally about whether Android is "open" as in open source and open standards (which ever more observers have concluded it is not), but since Skyhook is a relatively small company, this matter got a great deal of attention only after 418 pages of documents came up in discovery, exposing Google's attitude and strategy. It's possible that the controversy over mobile payments will also raise similar issues as the Skyhook case did. That might happen if some Android device makers opted to use a competing service, such as PayPal, and if Google then used what it calls its "club" to make device makers do what Google wants (its control over the Android trademark and certain closed-source components, particularly the Android Market client), then we'd have a perfect mirror image of the Skyhook case. But even without the "openness" issue, eBay's and PayPal's lawsuit is already a bigger disaster for Google. The eBay/PayPal group is a much more powerful and famous plaintiff than Skyhoook, and this complaint makes Google and its leadership look ruthless and sleazy, compared to which it's a lesser evil to be accused of just being "not open" and heavy-handed (except in the eyes of genuine, unbiased and truly independent advocates of Free and Open Source Software, which are hard to find). Paragraph 45 of eBay's and PayPal's complaint makes a high-ranking Google executive appear unbelievably thoughtless: apparently Google Senior Vice President Stephanie Tilenius poached a former PayPal colleague via a Facebook (!) message (which may have been read by any number of other PayPal folks) during a period for which she had, allegedly, an explicit contractual obligation not to do so. Considering this early stage of the process, eBay's and PayPal's allegations are already amazingly detailed and specific. They don't just make vague assertions; they quote from particular messages (even email and text messages) and state particular dates on which certain things happened. They also describe how some confidential data was allegedly copied, in contravention of employment contracts, to a Dropbox account as well as a non-corporate email account. Besides some PayPal-specific issues the complaint also restates the often-heard accusation of Google being a data hog that doesn't respect people's privacy, claiming that "Google Checkout is mostly a tool for acquiring customer information for the benefit of Google's other products and services", an accusation that appears very tough since Google probably wanted and still would like to make money with its Checkout service. The broader picture is that Google's ethics and business practices are now at issue in an antitrust case in Texas, a full-blown European Commission investigation, the Skyhook dispute, antitrust complaints filed by two South Korean search engine companies in connection with Android, and now the eBay/PayPal complaint. According to Reuters, the Federal Trade Commission of the United States is seriously considering a broadbased antitrust investigation as well. It's generally noticeable that the competition law issues facing Google are increasingly related to its dealings in the mobile sector -- disproportionately much when considering that it represents just a fraction of Google's overall revenues, but less surprising when taking into account how much is at stake there. The way Google appears to deal with competitors and "partners" (such as Android device makers) as well as its frequent conflicts with intellectual property law are not only in sharp contrast with its "Don't Be Evil" meme but have also made Google a number of powerful enemies in recent years. I saw that the world-class law firm of Orrick, Herrington & Sutcliffe represents eBay and PayPal against Google. Orrick did and maybe still does a fair amount of work in the past for Apple, Microsoft and Oracle. Those three players also have intellectual property issues with Android. Microsoft recently filed the first-ever antitrust complaint (note that "antitrust" in this context does not include "merger control" matters) in its history against Google (with the European Commission). Microsoft sued Google over a trade secrets issue (like eBay's and PayPal's case related to the poaching of an executive) years ago, and Google just hired the law firm that defended its behavior in that context (Keker & Van Nest) to now become the third law firm to defend Google against Oracle's patent and copyright infringement assertions. Everyone knows that Google and Facebook are at loggerheads. It recently turned out that Facebook had hired a PR firm to propagate unfavorable information about Google. That revelation temporarily distracted from Google's own practices, but with eBay's and PayPal's complaint, the spotlight is again on "the Plex". Apple, eBay, Facebook, Microsoft and Oracle are a pretty impressive group of five companies taking issue with Google. Then there's the possibly very complicated relationship between Google and Motorola. Like I said, Motorola was the first company to be bullied by Google out of a partnership with Skyhook, and rumors have recently been flying that Motorola is considering building its own mobile operating system to regain control. Google is increasingly isolated. The relatively best friends it now has among major industry players are probably IBM and Red Hat. Those like the idea of exploiting open source the way Google does, and that's probably their common denominator. Contract law: employment agreements (including non-compete covenants) and related non-disclosure agreements and guidelines accepted by the employee. eBay and PayPal do make reference to them. Microsoft is currently doing so quite successfully against an employee who went to Salesforce. It's also possible that eBay and PayPal could obtain injunctions against one or more of their former employees now working for Google on mobile payments. Enforcing general non-compete clauses appears very difficult in California due to a ruling in 2008, but it could be that PayPal employees agreed to particular terms that are enforceable. There's significant leverage in the fact that such rights are asserted against the former employees. From a liability point of view they aren't necessarily fully covered by their new employers. eBay and PayPal assert breach of contract and other theories against two executives who joined Google (Osama Bedier and Stephanie Tilenius) and reserve the right to sue up to 50 (!) other individuals, who are currently referenced in the complaint by a placeholdder ("Does 1 through 50"). Generally it's easier to use those contractual rights to prevent further violations than to take action against what has already occurred. Damage claims can also be based on those theories, but competition law and, above all, intellectual property law can give (depending on the circumstances) the original employer much more leverage. Hiring employees from competitors for the purpose of using a competitor's confidential information can be deemed one of many manifestations of unfair competition. In the eBay/PayPal vs. Google case, the fact that someone was poached while negotiating with Google on PayPal's behalf looks particularly bad. But in most cases of this kind, companies will (as eBay and PayPal have) also bring intellectual property rights into play. If an infringement of such rights is proven, it is often possible to prevent an unfair competitor to continue to make use of some of that confidential information if it's of a technological nature. Intellectual property rights are diverse. If an employee actually copies source code and then incorporates it into a competitor's code base, that would (at least) constitute a copyright infringement. However, eBay and PayPal don't make any such assertion (at least at this stage). Instead, the kind of intellectual property they are explicitly asserting now is called a trade secret. It relates to information whose confidentiality companies protect. The world's most famous trade secret is the Coke recipe. And the very opposite of a trade secret, and in most fields of technology a more powerful device, is patent law. Let's now look at the role of those different IPRs in connection with eBay and PayPal. Of those intellectual property rights, patents are, at least in connection with software (even if maybe not in a field like pharmaceuticals), often infringed inadvertently. Intentional infringement does happen, and if it happens, it can result in treble damages under U.S. law. But the way patents work is that everyone has the theoretical (even if not always practical) option to check on public patent registers (such as the USPTO database) and steer clear of infringement. There are too many patents to do that, but that doesn't give anyone the right to infringe a patent. If you litigate, a patent dispute is fundamentally about whether the accused product or service practices what the asserted patent teaches (provided the patent is valid). Only if willful infringement is alleged, there's an additional need to evaluate whether the defendant acted intentionally or not. With trade secrets, the question of how the information was misappropriated is an essential, indispensable part of the consideration. That makes it harder to prove. But in terms of a company's or a person's reputation, the alleged theft of trade secrets is "really bad stuff": there's no moral (even though not legal) excuse of inadvertent infringement. With patents, you're morally innocent until proven guilty (even if proven to infringe, with the possible consequences of an injunction or damage awards against you). With trade secrets, if a court rules against you, you're inevitably exposed as a convicted thief. If eBay and PayPal can prove a misappropriation of trade secrets by people now working for Google -- or even before the end of the lawsuit at least achieve that strong indications for such misconduct show up in discovery --, then Google will have a terrible reputation as an infringer (in terms of an employer of infringers) in connection with Google Wallet. And at that point any patent infringement allegations would have even more weight. eBay and PayPal could also have tried to file two parallel lawsuits. The one they just filed is based on California state law. Trade secrets are recognized by U.S. federal law, but they aren't part of it, unlike patents. Patent disputes are filed with federal courts. In that case, the logical venue would be the U.S. District Court for the Northern District of California (where Oracle is suing Google). Maybe there will be a near-simultaneous patent suit these days. Perhaps eBay and PayPal wanted the public to initially focus on those breach-of-contract, trade secret and unfair competition issues, all of which deal with willful nasty behavior, which isn't always the case in connection with patents. This dispute is about rather recent technologies related to mobile payments. PayPal had filed for 11 now-granted U.S. patents before and shortly after being acquired by eBay, and eBay has 188 U.S. patents in its own name. But the patent examination process at the USPTO takes years. It's fairly possible that some of the technologies about which the "deserters" may have told Google and which are likely relevant to mobile payments were developed and patented just in recent years, and maybe some important patents could be issued during the next year or so and greatly enhance eBay's and PayPal's ability to make patent assertions against Google Wallet. An obvious question is whether Google would be able to countersue eBay. While Google's own patent portfolio is relatively weak, it is yet bigger than eBay's patent holdings. Google apparently doesn't have any patents it can use against Oracle, and even if Google actually acquired Nortel's patents, it might not have any serious ammunition to use against a company that's mostly about enterprise software. But with eBay and PayPal it's possible that some of Google's patents (even certain search patents) might represent a credible counterthreat. That would be another reason for which eBay and PayPal might rather wait until they get particularly relevant patents (relevant in terms of mobile payments) granted. While eBay's and PayPal's Santa Clara complaint does not mention the word "patent" even once, its paragraph 9 mentions eBay's "substantial intellectual property in [the field of online and mobile payments]". And that term does, as I explained, include patents. Also, I'm convinced that any settlement between Google and eBay/PayPal would certainly address patents as well. It wouldn't make sense to leave that question unaddressed. With a view to a possible trial in five months, Google just added a third law firm to the legal team defending it against Oracle's patent and copyright infringement claims. That firm is named Keker & van Nest LLP. Given its reputation and specialization, and considering that the related notice of appearance for six of that firm's lawyers was filed the day after Judge Alsup issued his case management order for the next months, this is a clear sign that Google is getting ready for a possible trial, which will (unless there are delays or the case is stayed) begin on October 31, 2011 and last three weeks. Oracle has been represented from the start by two firms: Morrison & Foerster and Boies, Schiller & Flexner. I believe Oracle is pleased with the progress it has made, which is why we see so much continuity on their side. For the first eight months, Google relied exclusively on King & Spalding. Earlier this month I noticed for the first time that Google added Greenberg Traurig's Heather Meeker. She's a specialist in open source legal matters (who accurately pointed out in her book The Open Source Alternative that the GPL is "irretrievably ambiguous" in connection with what's called the copyleft border dispute) and outside counsel to the Mozilla Foundation. She furthermore advocates the patentability of software, by the way. Given that open source issues already came up in Google's answer to Oracle's complaint, it would probably have made sense to have Meeker involved even earlier. Generally, the best lawyers will be total professionals and always cooperate well with additions to the team. It's not unusual for big corporations to hire two or three law firms in connection with a major dispute. It may sometimes make sense to bring in additional expertise for different stages of a litigation, or depending on what the priority issues turn out to be as the case unfolds. But it can also be a reflection of unease and of a lack of faith in the original litigation team's abilities as the decisive stage is nearing. "We take the tough cases -- the make or break cases where companies, careers, and reputations are riding on the result. True to our roots as trial lawyers, we relish the courtroom battles. Still, whether we go to trial, settle, or just make the problem go away, what matters is obtaining the best result for our clients." The first sentence about "make or break" and companies and careers being on the line raises the question of how much is at stake for Google here. Obviously, any somewhat realistic worst-case scenario would still enable Google to stay in business. But the stakes are high indeed. Maybe Oracle will want Google to make technical changes that would require rewrites of many applications. In case the only way Google can settle with Oracle involves a high per-unit royalty, Google may feel forced to determine that it can no longer publish any Android code on open source terms in an economically viable way. There comes a point when patent licensing costs are so high that Google can no longer give Android away in order to generate revenues through mobile advertising and services. "Open" just ain't the word. Oracle's lawsuit has implications that go way beyond philosophical debates that mostly take place within the open source community. Just that one lawsuit could force Google to depart from its open source business model for Android (and there are many other Android-related patent infringement suits, 42 so far by my count). While Android isn't even truly open now, the economic implications of this could become the final nail in the coffin of Android's positioning as an open source mobile operating system. Google might have to pass Oracle's royalty on to device makers and charge them, putting Android exclusively under a commercial license. The possible end of Android's already questionable openness is a make-or-break situation of the kind Keker & van Nest's lawyers love to take on. That San Francisco litigation firm has done some work for both parties before. I found this law.com article, which declared Google's legal department the best one of its kind in 2011 and mentions Keker & van Nest's involvement with a case related to "orphan books". Another law.com article reports on a spin-off from Keker & van Nest, which resulted in the creation of the Durie Tangri firm. Google is mentioned among companies that would be expected to continue to use Keker & van Nest (though they now also work with Durie Tangri). The Legal 500 directory lists both Google and Oracle among Keker & van Nest's clients, and describes as one of the highlights of John Keker's work his "2005 representation of Google against Microsoft in a high-profile trade secret case." Apparently Keker & van Nest believes that the work it previously did for Oracle doesn't create a conflict in connection with this case. 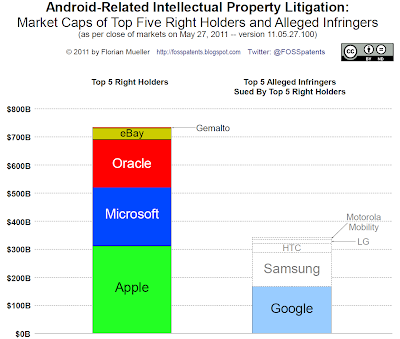 Maybe those cases were about different patents and copyrights than the ones at issue in the Google case. Judge William Alsup (U.S. District Court for the Northern District of California) has just filed his response to Oracle's and Google's joint case management memorandum, about which I blogged on Wednesday. Besides accepting all items on which Oracle and Google had reached agreement in their joint memorandum, the judge granted Oracle its most important wish: the final decision on the number of asserted patent claims to go to jury trial will not be taken now but instead at the final pre-trial conference. But the judge also wanted to put a clear damper on Oracle's hopes of being able to assert a large number of claims: based on Oracle's demands, the judge might still order a stay of the entire case pending reexamination of the patents-in-suit by the USPTO, which would take years. The judge even writes that he "doubts that the number of claims Oracle would ask a jury to learn and to evaluate is 'triable'". That's a strong message that he considers Oracle's most recent position (21 claims) excessively high and wants Oracle to reduce its demands substantially. While the judge keeps the pressure on Oracle in that regard, this is very significant headway for Oracle. About three weeks ago the judge had proposed a "tentative case schedule" according to which Oracle would have been required to reduce the number of its asserted claims (from originally 132) to 3. But Oracle strongly opposed that proposal and wanted both a higher number and wrote that "[j]ust as important, the ultimate decision on the number of claims should be made closer to trial". At the time I wrote that I thought the number of three claims was an overly aggressive proposal by the judge, and with today's decision to determine the number closer to trial, it's clear that the judge didn't want to order a reduction to three (at least not at this stage). Since that point in time, Oracle has consistently asked for the right to assert 21 claims (three claims from each of the seven patents-in-suit), and has consistently proposed a postponement of this determination. I pointed out before that the most important metric will be how many different patents Oracle gets to assert. Oracle certainly wants to assert multiple claims per patent, but not getting to assert several claims per patent would be much, much less of a lost opportunity for Oracle than having to drop entire patents. The way the judge phrased today's order is not merely face-saving. I think he does maintain a position of significant strength. Come October (the trial is scheduled to begin on October 31 unless there's a stay), Oracle will find itself in front of both a carrot and a stick. The carrot is the possibility of a trial in the very near term. That could put significant pressure on Google to settle, although I wouldn't be surprised if Google actually took its chances and let this case go to trial. But the stick is that the judge could still stay the case pending reexamination unless Oracle reaches an agreement with him on the number of asserted claims. The postponement of the decision is a huge improvement for Oracle over the proposal the judge made three weeks ago. It's also a major opportunity for Oracle to convince the judge in the meantime that the claims Oracle wants to assert are so distinct from each other that Oracle is entitled to all of them under applicable case law, i.e., the Katz case. I'm sure the judge fully understands Oracle's rights, and I guess that's why he decided not to put in an order that would deprive Oracle of due process. Instead, the judge argues with the court's caseload, pointing to "the number of civil cases that will be ready for jury trial during the period between the current lengthy criminal RICO-VICAR trial and those to follow". That fact still wouldn't change anything about Oracle's rights, but the judge wouldn't impose a narrowing of claims on Oracle: he would just stay the case if Oracle's demands are overreaching. Based on today's order it's impossible to know whether the judge would actually negotiate with Oracle or simply let Oracle take its chances. Each of them knows where the other stands: Oracle wants 21 (if not more), the judge proposed 3. The judge could discuss beforehand with Oracle which number Oracle should request at the pre-trial conference in order to get a trial starting on October 31. But he might also tell Oracle to make its formal proposal without knowing where the judge's limit is. That would be tough. I have to point out that in formal terms, the judge actually outlines three possibilities for what could happen after Oracle determines the number of claims it seeks to assert: the scheduled three-week trial (starting October 31, 2011); a further (possibly small) delay "until [the case] is trial-ready"; or a trial stay pending reexamination. In practical terms, the first and the third option are the ones that appear most likely. The judge previously explained that the clerk who has learned about all the details of this case won't be available after November, so I believe it really comes down to the two alternatives of either the scheduled trial or a stay. We might ultimately see Oracle propose one claim per patent (seven in total). But it's too early to speculate. I just venture to guess that three won't be the number, a number that some had reported prematurely three weeks ago. While most of the order addresses the contentious issue of the number of asserted patent claims, in formal terms it "simply approves the agreed-on points", i.e., everything on which Oracle and Google reached agreement in their joint memorandum. In my understanding this includes a stipulation that Google will bring a maximum of four grounds of invalidity against each patent claim asserted by Oracle. Under the agreed-upon items, Oracle now has a little over a week (until June 1, 2011) to create a shortlist of 50 patent claims to be potentially asserted later. Two weeks later, Google will create a shortlist of six grounds of invalidity per patent claim asserted by Oracle. In my report on the joint case management memorandum I quoted a passage on how "six grounds" has to be interpreted here. In that blog post I also summarized the parties' agreement on a schedule for summary judgment on Oracle's copyright infringement claims (which was now also approved by the court). We will see Google's opening brief (and possibly also an opening brief by Oracle if they file their own summary judgment motion concerning the copyright issue) on August 1. The first app devs to have received Lodsys's letter were only a few days away from a deadline to respond, and under that circumstance I already felt forced to recommend to app developers to be cooperative and ask Lodsys to provide its license agreement for review, despite previously having pointed out that paying Lodsys the 0.575% royalty it demands could open Pandora's Box and result in further exacerbation of the troll problem app developers face. Hours later, Apple sent various app developers a copy of its letter to Lodsys. The text of that letter -- dated May 23, 2011 -- was shortly thereafter published by Macworld. In my view it's very good news, but I think Apple's letter in and of itself is not yet a reason to celebrate. This could still get quite unpleasant for some app devs. "Apple is undisputedly licensed to these patent[s] and the Apple App Makers are protected by that license. There is no basis for Lodsys' infringement allegations against Apple's App Makers. Apple intends to share this letter and the information set out herein with its App Makers and is fully prepared to defend Apple's license rights." "Apple requests that Lodsys immediately withdraw all notice letters sent to Apple App Makers and cease its false assertions that the App Makers' use of licensed Apple products and services in any way constitute infringement of any Lodsys patent." So is this the "blanket coverage" concerning Lodsys that I said app developers need because otherwise they have to take a license? I can't give you definitive legal advice. Chances are that a really cautious lawyer might tell you that Apple's sending you a copy of that letter to Lodsys is not a substitute for a detailed and highly specific agreement under which Apple would hold you harmless no matter what the outcome of a possible lawsuit might be. App developers have to understand that Lodsys can still sue them. Apple's letter does not prevent Lodsys from doing that, and it would be a way for Lodsys to pursue its agenda. It wouldn't make economic sense for Lodsys to sue a few little app developers based on the damage awards or settlements Lodsys might get out of such a lawsuit. However, for Lodsys it would still be worth it if this resulted in a lucrative settlement with Apple, or if it (alternatively) scared potentially thousands of app developers so much that they would pay. Lodsys would sue some app devs only to set an example, and for the ones to whom it happens, that would be an unpleasant situation. Assuming you are one of the app devs Lodsys might choose to sue, you could certainly contact Apple and say that in Apple's opinion, this is all about Apple's technologies and Apple claims to have a license to that patent. I can't imagine that they would leave you in the lurch in that situation. Again, a lawyer might say you need a more specific agreement with them, but considering that Apple has taken a clear position here, I think it's a given that they will then stand by you and provide the resources you need for your legal defense. Their letter to Lodsys is (at the very least) implicit coverage for you in this regard, also considering the reputation Apple has at stake. Apple would likely also try to join the fray as a counterclaimant and/or start its own legal action against Lodsys (maybe they're already preparing that). But wait: even if you rely on them doing this, it's still going to be very unpleasant to be sued by Lodsys. Apple would probably do whatever they can to shield you from the need to spend much time on this, but you would have to approve any pleadings and motions in your name, and you might have to testify in court if they successfully subpoena you. Assuming they sue you in Eastern Texas, you might have to travel there. I'm confident that Apple would cover reasonable travel expenses. I don't know whether they would also reimburse you for the time you have to spend on this -- time that you can't use productively. Now let's look at the possible outcomes of such a lawsuit. If Lodsys loses and Apple covers your legal fees, you're fine. However, if the final ruling is that there is/was an infringement of a valid patent and that Apple's license does not benefit iOS app devs, the position taken by Apple in today's letter to Lodsys would be proven wrong. To be clear, I think Apple's letter explains very convincingly why Apple is right and Lodsys is wrong. But there's always some uncertainty about litigation of this kind. So on a purely hypothetical basis, if Lodsys won, Apple would have been wrong. In that case, it would be hard for app devs to claim that Apple has a legal responsibility to cover them -- including whatever the damage awards would be -- since the court(s) would have found that the app developers are liable for their own creations. Even in that negative scenario it would make sense for Apple to cover its developers. You should just make sure that if you get sued, you work this out with Apple at that point. You can cross that bridge when you get there, but you should really work this out at the start of a lawsuit. Again, the most cautious approach would be to work this out with Apple even before possibly being sued. But one might also place a lot of trust in Apple based on its strong and clear letter to Lodsys and considering the reputation it has at stake. Lodsys claimed that it owns four patents, and only one of them was claimed to be infringed by in-app upgrades. Lodsys might still try to assert any or all of the other three patents against some app developers (or even the same one again but in connection with different infringement allegations). Since Apple has a license, it would certainly take a close look at such assertions to determine whether its license also benefits its app developers. But it's hard to tell what Apple would do if Lodsys made assertions that relate to the apps themselves and not at all to the platform Apple provides. For now, no intervention by Apple against MacroSolve is known. That is a case in which some app developers are already being sued, but the allegations don't appear to relate as closely to Apple's API as the ones made by Lodsys in its letters to app developers. If your app is also available for other platforms (of which Android would likely be the most relevant one at this stage), Lodsys could also make assertions against those versions of your product. Apple's decision to defend its license doesn't automatically mean that Google or others would defend their license to those patents, too. I would be quite optimistic that, for example, Google would not want to appear to stand by its app developers to a lesser degree than Apple, but that's still not a guarantee. I don't mean to be negative here. I just want to make all app developers fully aware of the issues they may still face. Since Lodsys is already suing a group of large players, which is collectively even more powerful than Apple, it would be irresponsibly optimistic to assume that Apple's letter all by itself is going to make Lodsys give up. Unless Apple settles the deal with Lodsys (neither the terms of such a deal nor the mere fact might ever be announced -- Lodsys might simply never follow up on its original infringement assertions), there will be some next step in this process, and things could still get nasty. So let's be optimistic today, but let's also be cautious. Note that by the time I wrote this original post, Apple had not yet taken any position on the Lodsys problem of patent assertions against defenseless little app developers, and there was no guarantee that they would, although I still expressed my belief that they would act. After what Apple has written, this present blog post has become obsolete in part. But I think it should stay online for the record, and with a view to other assertions that Lodsys and/or other entities might make in the future. Unfortunately, time is was ticking away. I understand that some app developers received their letter from Lodsys already a week before the first reports on this patent assertion spree were published. Everyone was apparently given a 21-day deadline to respond, so some people's deadline expires later this week. That's why I determined that I now had to issue comments at least on the situation of those whose deadline is near. But again, the situation has certainly changed due to Apple's intervention mentioned above. So for now, the opinions below are partly obsolete, but I will comment on the new situation in more detail in a separate blog post. As I pointed out before, note that I am not a lawyer (and in particular not your lawyer). These opinions of mine are not a substitute for professional legal advice based on a thorough analysis of your particular case against the background of applicable laws. I urge you to obtain real legal advice. I heard that Chuck Norris also received a letter from Lodsys and they are now paying him. But if you're just a little app developer and if Apple doesn't give you blanket coverage for whatever the consequences of a legal fight would be (also including the risk of a devastating damage award), your paramount consideration must be to avoid that Lodsys files a U.S. patent infringement lawsuit against you. That's why you should not let Lodsys's deadline expire. If your deadline is only a few days away, I recommend that you now indicate to Lodsys a willingness to pay up and ask them for further information on the terms and conditions of a license agreement. I'll discuss further below some of what you should avoid saying in that context, but basically you should demonstrate that you're cooperative. That doesn't reduce your risk of being sued to zero, but it's the best you can do at this stage to reduce it as much as possible. If they're going to sue developers, they'll most likely target those who appear to be uncooperative. Every one of you should avoid being part of that group. Think only of yourself in this regard. My FAQ for app devs contained a small section on U.S. patent litigation costs. In a report on Lodsys, MacWorld quoted a lawyer who said that "even to defend a basic patent infringement claim, one can usually expect to incur legal fees of over $1 million." Legal fees are just a part of your exposure. If you lose in the first instance (which can easily happen because Lodsys would almost certainly sue you in the troll-loving Eastern District of Texas), you may face a totally outrageous decision on damages. Your lawyers would argue that Lodsys is willing to license the patent at a 0.575% rate and that your revenues are low, so damages should be small, but none of that is a legal limit for the court. The jury could find that damages are much lower, but in many cases juries assume that licensing offers are sweet terms and there's actually more at stake. Maybe many legal experts would look at such a damage award and agree that it can be overturned, but then you have to appeal and win. Conversely, if you won in the first instance, you might still have to handle an appeal by Lodsys. Theoretically it could go all the way up to the Supreme Court. Being sued by Lodsys can ruin your little business. In case you don't have a company that comes with limited liability, it can ruin you personally, possibly for the rest of your life. In a situation like this, there's no way that you can afford the luxury of defending a principle, or depend on anyone's solidarity. Your business faces a legal risk. That risk is independent from how meritorious Lodsys's assertion is. Even if you believed that the patent can be invalidated and that the infringement assertion is wrong, it doesn't matter until you can afford to fight this out. To be honest, while I'm far from convinced of Lodsys's claims, I've seen much weaker ones that succeeded in U.S. courts, above all in the U.S. District Court for the Eastern District of Texas, which sometimes includes outrageous damage awards. By comparison, if I had to bet money on the successful invalidation of various patents, I would be significantly more likely to place my bet on the invalidation of MacroSolve's questionnaire patent than on that of Lodsys's patent. If you communicate with Lodsys, be a professional and be cool. Focus exclusively on solving your problem. You can't convince Lodsys that what they're doing is immoral. They want to make millions of dollars and you can't talk them out of that. It's also possible that they had to pay (or guarantee) so much for those patents that they don't have a choice anymore. So don't insult them. Don't criticize them. Don't start a debate: if you want to take political action, do it in the appropriate fora but not in your correspondence with Lodsys. Just ask for the terms and conditions of their license agreement. I wouldn't want to say anything that looks like an admission of infringement. But it doesn't make sense to deny it unless you have the resources in place to fight it out. Be non-judgmental on the question of whether or not there is an infringement. Lots of patents get licensed all the time just to avoid litigation. You as a little independent guy can't do what's best for the app dev community at large. Be a coward who stays in business, not a hero who goes bankrupt. Keep in mind that you have to do what's best for you just like Lodsys does what's best for its shareholders. Lodsys is definitely not doing what would be best for all patent holders, or for all non-practicing entities. I'm sure that many other patent holders are quite afraid of the repercussions that this can have, not because of Lodsys collecting its 0.575% cut but because of what will happen if this scheme works. Legitimate and reasonable patent holders may ultimately suffer as well. If little app devs are the victims of a fundamentally unjust easy-money scheme, there will be a point at which there will be some serious political backlash because of so much injustice happening to little software developers who never stole anything from anybody. Patent assertions against app devs are particularly tricky because they can have an indirect effect on the business of big pro-patent players like Apple. But Lodsys doesn't care about any of that longer-term political stuff. Lodsys wants to make money right now. Take the same short-term perspective as Lodsys does. By stopping to sell your app or by deactivating the in-app upgrade button you can't even avoid the risk of a lawsuit (over past infringement). Yes, there are already others than Lodsys that require app devs to pay, and there will be more. In light of that, even 0.575% is too much because if the hurdle is so low that anyone waving with a patent can get you to pay, there will be many more assertions going forward. But in the meantime you can make money and you can still go out of this business if the collective amount of your patent royalty obligations ever reaches a point at which you decide to quit. Even if you paid, say, 5% of your U.S. revenues in the aggregate of several patent assertions, that's just 5%. If Apple increased its app store cut from 30% to 35%, would you say goodbye to the iOS platform? I guess not. Maybe a lot of people would threaten with it, but seriously, the fewest would. Maybe that would make other platforms more popular, but app developers on other platforms also face patent assertions as MacroSolve already proves. Note that I didn't say you should sign just whatever license agreement they propose. I merely said that you should be cooperative and demonstrate that you're willing to consider a license deal. Everything will then depend on the terms and conditions of whatever Lodsys proposes. Even the best license agreement won't reduce your risk of being sued to zero. Lodsys could sue you over that agreement, over issues outside of that agreement, and others (like MacroSolve) could sue you (even without an advance warning). But we're talking about probabilities here, and I think Lodsys may very well offer a reasonable license agreement. The letter Lodsys sent out to app devs contains lots of positions that I disagree with, but it's possible (though not guaranteed) that Lodsys wants to be reasonable. Lodsys also tries to create that perception through its blog. The thing to make sure is that a license agreement isn't so bad that your risk of being drawn into litigation is even greater than before. Again, I see indications that Lodsys's agreement is probably not that bad, but it will be key to look at it in detail whenever they disclose it. They're going to use the same license agreement for multiple developers. If only the common parts of all of their proposed agreements are published, they can't know with certainty who leaked it. The agreement could then be published (feel free to contact me) and discussed. I have been contacted on Twitter and via my contact form by patent lawyers who have sent me information on possible prior art to use against Lodsys or Macrosolve, and by some who have made general recommendations for how you (the app devs) might defend yourselves. That kind of input may be well-meant, but I told all of them that it isn't a solution to the actual problem. The real issue here is that app devs can't afford the fight. As long as they can't afford to defend their rights, it doesn't matter if there's some great prior art somewhere out there. There are a couple of reasons for why they do that. The short version would be, "If all you have is a hammer, everything looks like a nail." Their whole work is all about fending off such issues, so they just propose what they would be able to do, but they don't understand that there's no way an app dev can fight against a 0.575% royalty demand if the alternative comes with a considerable risk (in some cases, an incredibly high risk) of possibly going bankrupt. What those lawyers propose works for clients who can afford the costs and the risks. Even if someone was optimistic about being able to defeat Lodsys in court, a low risk of financial ruin is still not acceptable, but some of those who insist on those alternative approaches just don't want to face that fact. One very popular suggestion now is to ask the USPTO to reexamine the Lodsys patent in question. It was mentioned in various places, including this Macworld article, which quotes a patent professional who says that the cost for this is "lower" and "more predictable": his estimate is in the $20,000 to $30,000 range. Unfortunately, reexamination takes years and in the meantime Lodsys can litigate. This makes it a non-solution for all those who can't afford the costs and risks of patent litigation. Also, the likelihood of such a patent infringement case being stayed pending reexamination is limited. Google has been trying for a few months now to have Oracle's patent lawsuit stayed for the duration of the reexamination of the patents-in-suit, but right now that case is more likely to go on trial in five to six months than to be stayed. Reexamination would make a lot of sense as part of a whole package of measures to be taken against Lodsys, but not on its own. I believe the reason why some patent professionals insist so much on suggestions of non-solutions is this: they would like to believe (and would like the world to believe) that patents are fundamentally a good thing and do justice. But the Lodsys scenario is a case of blatant injustice and raises serious questions about the system as a whole. That's why some lawyers would like to propose a fix that works within the system, so as to prove that the system has the tools in place to fight its own excesses (such as low-quality patents being granted). But until they answer the question of how the app devs can afford the costs and risks of a patent infringement lawsuit that Lodsys might bring against them (most probably in Eastern Texas, where Lodsys is based), don't rely on their advice. Instead, do a deal with Lodsys if you can get one that greatly reduces your risk of being sued. After taking such a strong position in favor of a license deal, some may wonder on which side I stand. I can answer this question easily. I'm giving you independent views here. No one influenced them in any way. I'm telling you what I think works best for each of you, even though I do know that ultimately this is bad stuff for the app dev communtiy at large. I just want to avoid that any one of you goes bankrupt when the alternative may be to pay a 0.575% royalty (and possibly more royalties in the future, for different ways to use that particular patent, for different Lodsys patents, and for different patents held by others). I still hope that Apple will take action and enable app devs to defeat Lodsys in court. In this analyis of all the patent issues Apple is facing I have also explained that I believe it would be the right thing for Apple to do, though Apple certainly knows more about its business than I do. In my opinion, Apple should also help iOS app devs who are currently being sued by MacroSolve. To the extent that non-iOS versions of certain apps are targeted, they should work with other platform makers (in that case, Google and RIM would be the key ones to partner with) to jointly support the app devs. MacroSolve is worse than Lodsys. I want both of them to fail, and I want anyone else to fail who attacks little app devs who haven't committed any wrongdoing. In fact, I told this directly to MacroSolve's CEO. After I reported on their two lawsuits against app devs, their PR agent contacted me and we set up a call in which their president and CEO wanted to explain their strategy to me. I accepted to have a conversation (even on the same day) because I do want to be fair and hear different views. He tried to convince me that they're actually very nice to little guys. It was clear, however, that they're only nice if you license their product. If you dare to develop your own software, they may claim a monopoly based on an unspeakable patent and just sue you, and he didn't even want to answer when I asked him whether he could deny that they sue app devs even without any advance warning. The call lasted more than 30 minutes and they thought they could convince me that what they do is perfectly fine and good for little guys. In order to make it clear that all he explained about his business just reaffirmed my concerns and that the conversation was becoming a waste of time, I said this: "Let me be frank. Just like Rush Limbaugh said he wanted [President] Obama to fail, I want you to fail." I explained that I hope some big players would provide the app devs with all the funding that's needed to defend themselves vigorously against MacroSolve's claims. I just told you this so you can see where I stand philosophically on this issue. But as a blogger I can tell these kinds of companies what I think of their "business models." However, when you try to work out a license deal with them, just steer clear of getting into any of that debate.